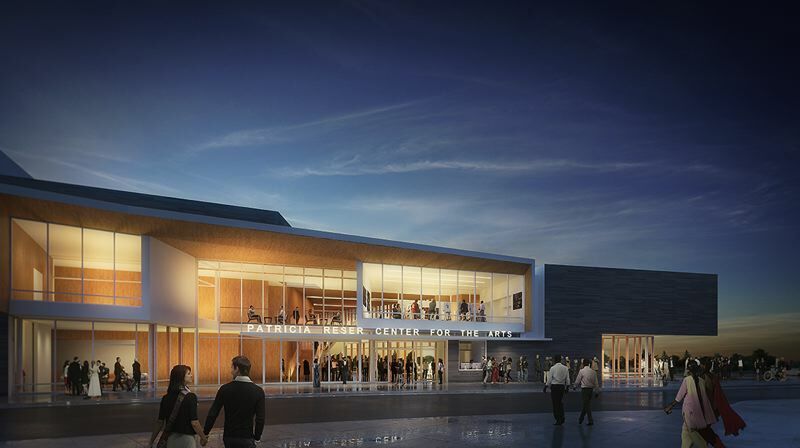 Beaverton Planning Commission clears $46 million arts center named for Patricia Reser and $24 million parking garage next to it. An arts center and parking garage in downtown Beaverton have taken two more steps toward becoming a reality. The Beaverton Planning Commission gave 5-0 approval Wednesday, Feb. 6, to plans for the center — which will be named in honor of major donor Patricia Reser — and for a seven-story garage next to it. Advocates also said fundraising for the center itself is now just $6 million short of a projected total of $46 million — and that is before the campaign goes public. Residents across the street from the proposed complex — among them the chairwoman of the planning commission — raised concerns, but commission members said they believe the project team has dealt with them. "It is a tight spot. But this is our (city) core, so we are trying to make sure that our core has things to do," said Terry Lawler, the commission vice chairwoman who presided. "This is going to be a crowning achievement. I am in support of this wonderful new addition to our city." If there is an appeal, which must be filed within 10 days after the commission signs a final order, it goes to the City Council. Groundbreaking is expected in the fall and completion in spring of 2021. The project will still require permits for site development and construction, but those are not subject to public hearings. The 2.8-acre site is bound by Rose Biggi Avenue to the west, Watson Avenue to the east, and Crescent Street to the south. Trees will be removed to the northeast, but a natural area will remain next to Beaverton Creek. The concept of an arts center dates back to Beaverton's Community Vision action plan in 2010 — it was updated in 2016 — and planning for a center began in earnest in 2015. The center itself would occupy an acre and house a 550-seat theater, lobby, art gallery, event and rehearsal spaces. The first floor of the garage would have 6,700 square feet for retail or restaurant use, a loading dock, and space for shared electrical and mechanical equipment, recycling and trash, and storage. Six other floors would offer parking for about 350 cars, although 82 spaces will be reserved for residents of the Lofts, the condominium complex at 12600 S.W. Crescent St. south of the arts center and garage. They will lose their current surface parking. Chris Ayzoukian, the center's general manager, said it will accommodate a range of arts and business activities for the entire community, not limited to performers or attendees. "We are planning for this venue to be a central gathering place that activates this area," he said. Fundraising momentum has grown in a few weeks. Advocates say they have now raised $5.1 million — up from $4.5 million reported on Jan. 15 — of a remaining $11 million toward their target of $46 million for the center, so they are within $6 million of their goal. Dave Vernier, a software developer, said that amount comes from 85 large donors such as himself even before the fundraising campaign goes public. Some of those donations, up to $25,000 each, are matched under a $250,000 challenge grant from the Oregon Community Foundation. "I think this center is going to be a huge hit. It is going to bring in money from outside Beaverton," Vernier said at the planning commission hearing. "We think it will become a center where people from Portland will come out here to see a performance, because there are not enough places for performances in the entire metro area." Two planning commission members made similar points before they voted for approval. Adam Matar said while he was growing up In Beaverton, he often went to Portland for arts-related activities. Now he has children of his own. "I am looking forward to the new types of memories they are going to have — and I will have with them — because of a project like this," he said. But he added that a public project brings its own difficulties. And it involves art. "What is the cliché in regards to art? Everyone has their own opinion on it and they are all right," Matar said to audience laughter. Gerry Uba said when his adult children visited him during the recent holidays, they went to Portland for performances. "If we have one (center) here in the city, they will come more often, which will make me happy," he said to more laughter. But Uba said major artwork, such as a mural proposed for the north wall of the center, must reflect the growing diversity of a community where one of every three people is other than a non-Hispanic white. The Beaverton Arts Commission will make the final determination. Residents of the Lofts, meanwhile, raised concerns about noise, traffic and lighting — particularly vehicle lights from the south wall of the garage, which will have metal louvers instead of concrete barriers at the request of police. That wall directly faces the Lofts. One detailed statement was submitted by Jennifer Nye, a resident who is chairwoman of the commission, although she spoke on behalf of herself and the residents. She did not take part in the commission proceedings, which were led by vice chairwoman Terry Lawler. 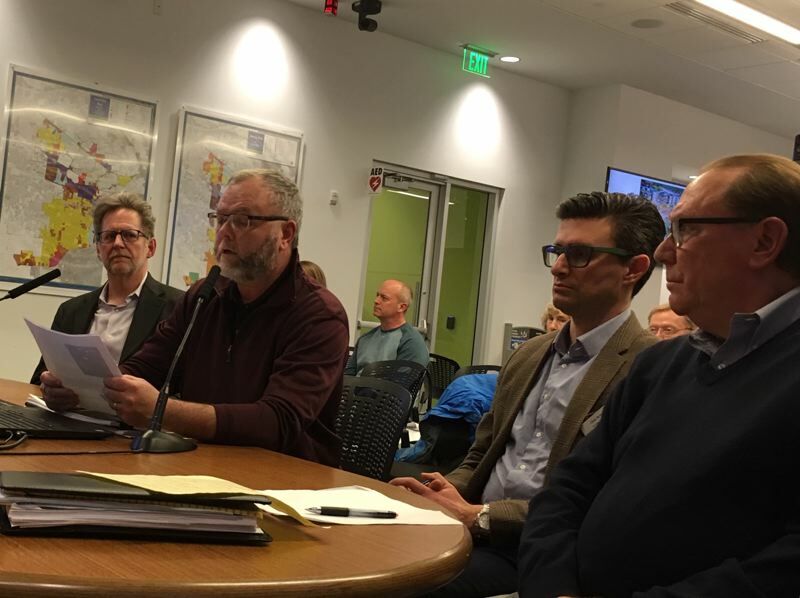 Bill Bezio, an architect for the Portland firm Mackenzie — the designer of the garage — read a statement detailing how the design will minimize the interference caused by vehicle lights and garage lighting. "I share her concern," said Joe Peter, who sits on the board of the condo association for The Lofts. "I am happy to see that a lot of that (concern), it seems, has been handled fairly quickly." He, Bruce Sharp and Ardith Sandoz also raised questions about noise and traffic. Jim Kalvelage, architect for Portland firm Opsis Architecture — the designer of the center — said concrete walls will absorb sound and "no sound will transfer out." Garth Appanaitis, transportation engineering associate with DKS Associates of Portland, said the complex will generate 323 more daily vehicle trips. The total might have been higher, but the complex is steps away from the Beaverton Central MAX station of TriMet, and Beaverton Transit Center is half a mile away. He also said that contrary to the operation of normal businesses, the complex will generate more traffic during evenings and weekends. "Based on a review of those (projections), we looked at what the worst of the worst conditions are," he said. "The worst are during the weekday evening peak" between 4:45 and 5:45 p.m.
"I came with a lot of questions, the public came with more questions — and I am very pleasantly satisfied with the answers I received," commission member Kim Overhage said. The garage is funded separately at $24 million, which the Beaverton Urban Redevelopment Agency will pay from a special revenue bond. It will have two elevators — the Watson Avenue garage south of the MAX tracks has one — and its parking spaces will not be as narrow as many of those in the Watson garage. "A tremendous amount of work goes into a project like this," commission member Scott Winter said. "Even getting to this point in the discussion in one night is remarkable. You have done a great job." Other participants in the project are Angelo Planning Group of Beaverton and Skanska USA Building of Portland, which will be the general contractor. NOTE: Makes corrections in finances of parking garage.